7-8 for skiers who want a smeary, drifty surfer. Mike Murphy is a former I.F.S.A. competitor and backcountry enthusiast who wanted to build the kind of skis he could not find on the dealer's racks for powder skiing. Sales commenced in 2010. "Whether in or out of bounds, the “Bullet” can do it all, from groomers to the back bowls. With camber underfoot and tip and tail rocker, it is a super versatile ski that can go anywhere on the mountain. Surprisingly at 112 mm. underfoot the “Bullet” feels just as stable cranking GS turns on hardpack as skiing bottomless powder on steep faces. If you’re looking for a powder ski that can do it all, look no further. Welcome to your new daily driver. 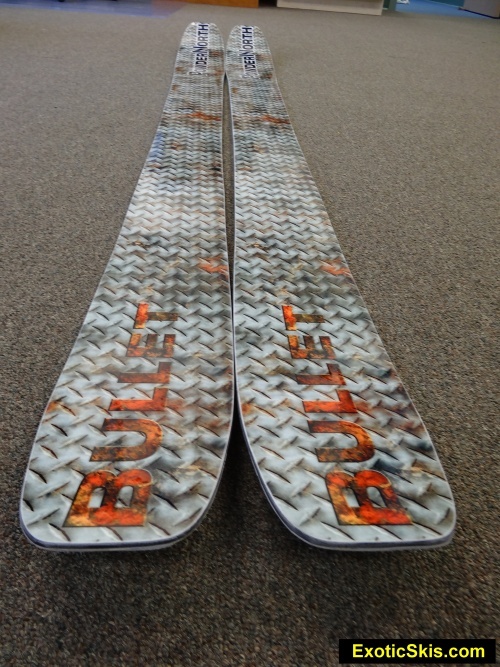 The “Bullet” was designed with a tapered tip and tail, camber underfoot and tip and tail rocker. 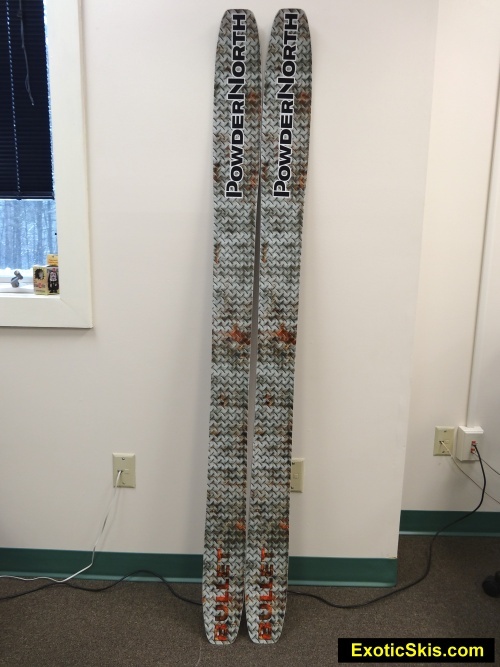 This ski is lightweight for touring in the backcountry, accessing all of your favorite powder stashes. The rockered tip and tail allows you to float through powder effortlessly, smearing wind lips and surfing the mountain in a whole new light. This ski is so responsive, just the thought of making a turn, the skis react, pivoting around trees." 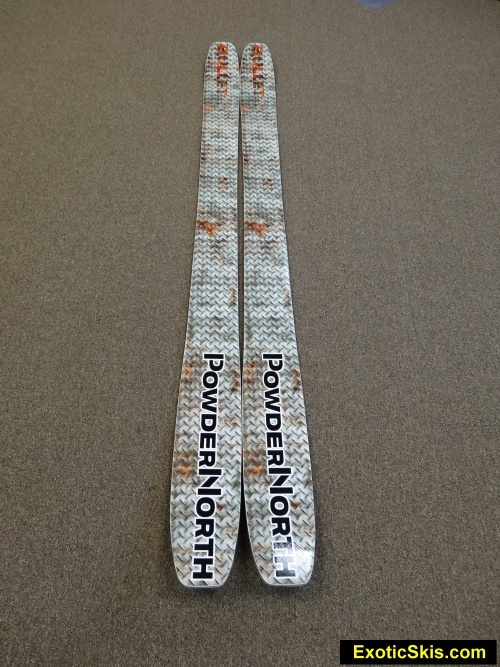 The Powdernorth Bullet is a remarkably grippy, nimble and quick-turning 112mm-waisted, rockered forebody powder ski with a very light, fun feel. While being quick and nimble, it can hold a GS-radius turn at speed without excessive nervousness on firm surfaces..but can surprise you with a turn at high speeds if you get lazy. The light and responsive body can get knocked-around a little at speed in choppy conditions, and the eager-to-turn personality might not please skiers looking for a damp-and-heavy freight train ride, but if you want a quick, sporty ski for a wide variey of snow conditions, this fills the bill. As with any multi-point-of-contact ski, tuning can change the personality of significantly, which is very handy once you get it dialed-in. The Bullet is fun, lively, spunky and impressively grippy for a widebody ski with a rockered front end. This ski would be fun for a variety of skiers who don't want a hard-charging, big-mountain weapon, but a versatile, all-mountain ride they could take nearly anywhere from back/side country to the frontside and feel right at home. You can ski it in a wide variety of conditions and have a great time doing it. Basswood/ash vertical laminate wood core, VDS rubber, Entropy bio-based epoxy, Durasurf sintered bases, UHMW sidewalls, triaxial fiberglass, carbon fiber, nylon topsheets. 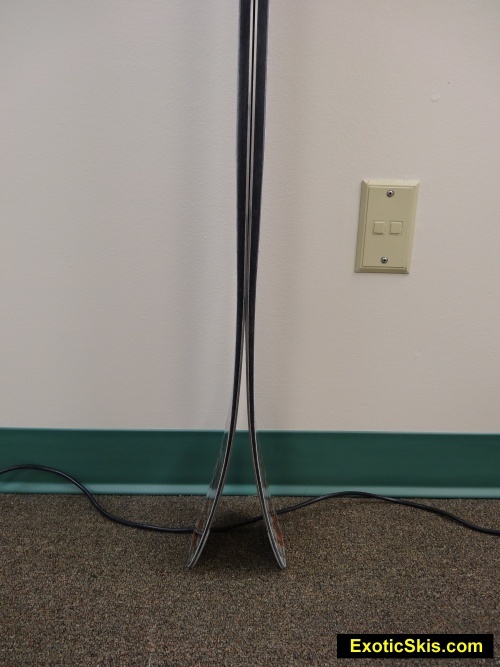 Tapered "sharknose" tip, tapered tail. Rockered forebody, camber underfoot, flat tail. Radius unspecified. 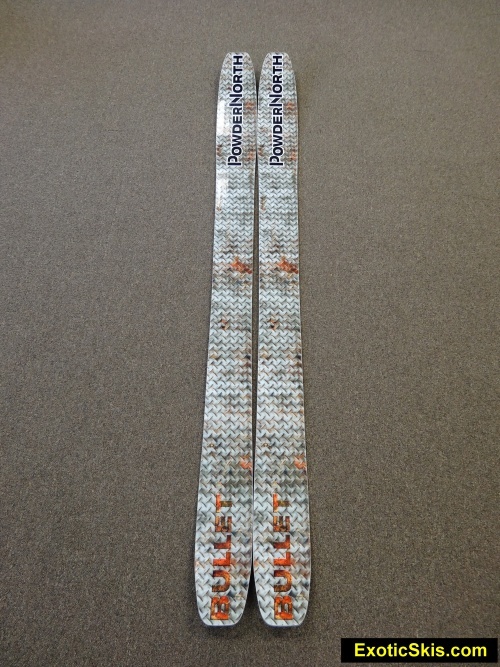 Updates coming in 2013-2014 to possibly include a more stout flex...check with Mike Murphy. Tyrolia SP12 demo bindings (stock - no riser plate) mounted "on-the-line". The ski flexed relatively soft, but snappy, with light vibration dampening and good torsional strength...giving the impression this was a turny, quick-response ski. Sighting down the edge showed it was a multi-point contact ski...in a class similar to the Rossignol S7, DPS Wailer 112...etc., with enough camber underfoot to be sporty and responsive on harder surfaces. Not a full-360-degree edge wrap around the tip like many skis these days, small portion of the tip is left un-edged. Noticably light weight. Eastern hardpack, packed powder, powder, trees and groomers. No wet, heavy or corn conditions. My first runs on the Bullets were on "bulletproof" hardpack, and I was remarkably surprised they bit and gripped very well and were perfectly secure underfoot for slow or fast turns in short or long radius mode. Surprisingly grippy and quick on hardpack surfaces for a ski this size….on par with the DPS Wailer 112 Hybrid, Liberty Helix which are leaders in fat ski grip on groomers…etc. No "doing-the-splits", no slip, no insecure feel whatsoever. More substantial underfoot when pressured than expected. Light swingweight, snappy, quick and secure. Great response to punched-turns or arced-turn styles. Very good feedback underfoot, telegraphs exactly the type of surface under the ski at all times. Able to drift and smear relatively well on groomers without unexpected tip or tail grabbing, no quirky behavior…very predictable at slow and higher speeds on the groomers back to the lift. Heading off into the choppy trail-edge junk, the Bullets surfed in and out with ease, going back and forth between soft and hard surfaces, smooth and cobbly material just as they were told. I was impressed with how quick I could get them to change directions since they were 112mm waisted and sporting a 140mm shovel. They definitely feel shorter than they measure (probably due to their lightness and short running length) and have a mischievious personality, begging to be taken off into the woods. Other test days found a mixture of packed powder, shallow powder and crud, sometimes mixed with old crust and hardpack...a good variety for testing. We did not get a chance to get them into deep powder, but that will come in a follow-up review as soon as we get a respectable dumping. The PowderNorth Bullets came to us unfinished, so we ground them to Mike's specs ( 1 degree base, 1 degree side bevel), leaving them sharp tip-to-tail for the initial tests, with minimal standard detune at the tips. In snow-filled bumps in this state of tune, the shovels wanted to engage and pull the skis across the hill sometimes, giving a slightly hooky feel at times. This is common in many multi-point skis, and detuning the tips by adding a bit of bevel to the initial portion of the rocker contact point backwards reduced this feeling without harming the secure grip in the midbody and tail. The tapered, flat tail worked really well in tight terrain and open terrain providing a solid platform to rely on without washout, but yet did not "hang up" in bumps and tight situations. 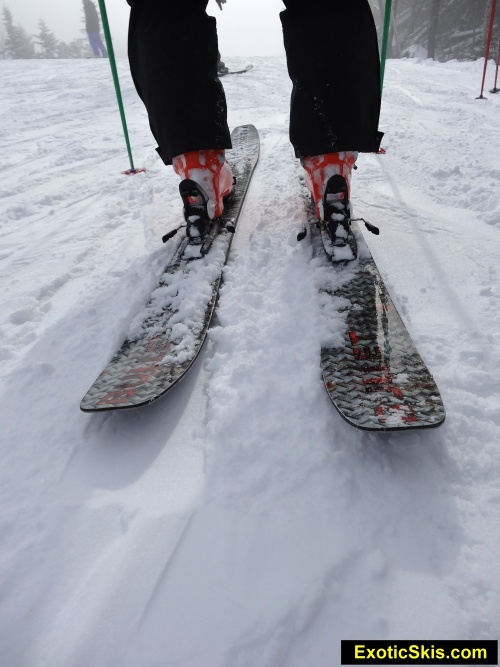 Like many lighter, rockered skis at high speeds, the short running length makes the ski feel short, with a slight flap in the forebody, but unlike many skis, the Bullets have a secure grip along the contact length all the way back to the tail, so you don't feel unglued from the surface at such speeds like some skis. The tapered nose resists deflection in cruddy conditions, but if you get forward of center-stance, you can engage the forebody quicker than you might expect in crud, making the ski think you want to change direction. Staying centered in this kind of snow prevents the feeling the ski wants to prematurely turn. The relatively wide forebody and shapely sidecut lends itself to agility, but can also be sensitive to directional hints at higher speeds, so pay attention! As of this posting, we did not have any deep powder due to no-snow in January 2013, so a full powder test will have to come in a follow-up. I did get the Bullets into some shin-deep powder in smooth and bumpy terrain and they were very quick to turn and secure, always able to scrub speed on demand. The Bullets were an "eager" powder ski, more lively than passive, and were able to adjust depth easily at slow or faster speeds. While they could be thrown sideways without much effort, they did not give the impression of being a "surfy plank", but more of an agile navigator. I think in the tight Eastern woods, these 180cm versions were just right, and in more open snowfields, a longer version would the just the ticket. 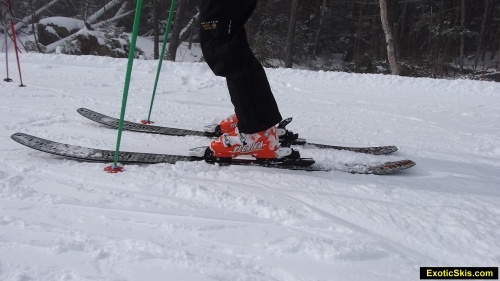 The tapered "sharknose" tip and tail let the ends of the ski be moved through the 3D snow easily, with floatation coming farther down the forebody and center of the ski. Stay tuned for a full powder report as soon as it snows! The word that kept coming up in my mind as I skied the PowderNorth Bullets was "fun". Mike was super helpful and informative during our discussions back and forth about the skis, and he is truly passionate about making skis people want to ski every day, and that's worth its weight in gold. Mike is the kind of builder who will constantly refine and tweak a design until it makes lots of people happy. A sporty bird-dog wiling to go out in rain or shine, fields or marsh, and dart about in all conditions happy as can be, always willing to play, able to outmaneuver lots of other dogs in the process, and cling to its track relentlessly. For the majority of mid-range to expert skiers, I would not change much, other than perhaps some carbon or additional VDS to dampen the ski's forebody a little. For those looking for a more charger-type of ski, I would stiffen the flex and perhaps increase the radius a bit for more high speed activities. Otherwise, it works well as a high-agility, all-terrain ski with a 112mm waist as long as you want grip instead of slarve as the default behavior. Quick, light and super easy to ski in resort conditions where there is powder in the morning, cut up conditions mid-day and groomers for lift access, or light enough for back country. It's an eager turner rather than a freight-train charger. 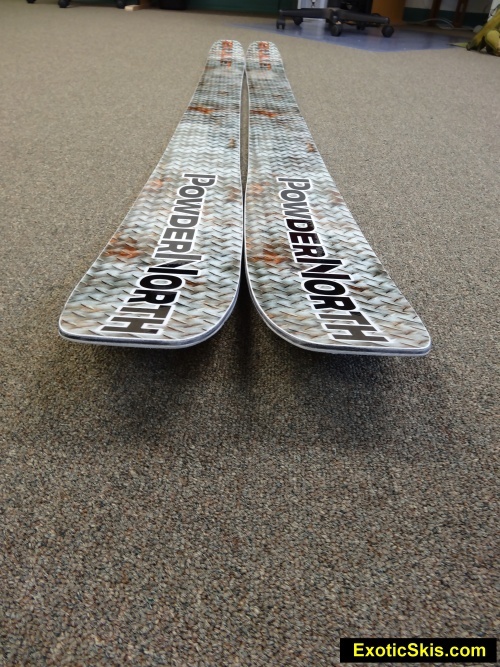 Really good first release effort from a new ski builder, and a ski I would keep in my quiver. 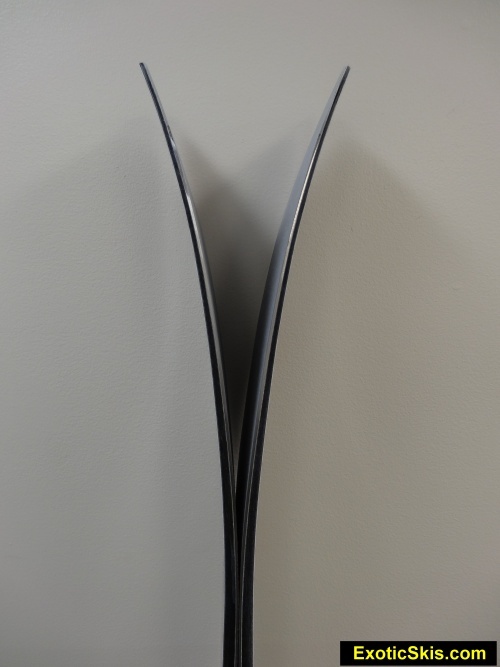 You may want to buy this ski in a slightly longer length than you might usually choose, and definitely expect to experiment with adjusting the bevel and detune areas of the forebody to get the behavior in 3D snow you want (like many skis with this shape). Good choice if you like lightweight-feeling skis rather than damp-and-heavy feeling skis.